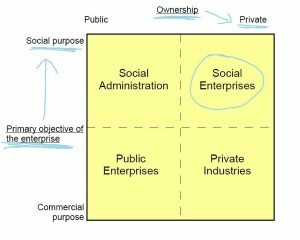 Social Enterprise and Social Entrepreneurs, sometimes referred to a “fourth sector” of the economy (added to the private, non-profit, and public/ governmental sectors) consists of private business enterprises that serve primarily social or public purposes. This is a growing segment of the economy, and a newly developing field of the law. For news and updates on this emerging Fourth Sector, as well on non-profit and corporate social responsibility (CSR) developments, please see our PublicPurposeBusinessLaw Blog.